This paper presents a special mosaic construction method developed for merging multiple non-destructive testing (NDT)images. Described in the paper are different geometrical image transformation models, estima tion methods of their unknown parameters, and a new method for equalisation of the transformation errors. The proposed new method is shown to reduce the final alignment error to no bigger, and in most cases smaller than the error introduced by the transformation parameter estimation methods. The performance of the proposed method is validated by simulation data as well as real ultrasonic and x-ray NDT data of aircraft components. Due to the relatively large size of aircraft components, NDT systems are usually capable of inspecting a comparatively small area of the component under inspection at a time. It is therefore necessary to perform the image mosaicing operation to merge a large number of sub-images acquired during the inspection process into one complete image of the entire component under inspection. However, as there exists an uncertainty in the component position and orientation with respect to the sensor, the mosaic construction requires special methods to be applied to ensure the correct alignment of all images in the mosaic. While all the three problems are discussed in this paper, the main focus of the paper is on error equalisation in mosaic construction using the rigid body transformation model for the image displacement. The purpose of error equalisation is to overcome mosaic inconsistency, which is one of the main difficulties in the construction of a mosaic with a large number of images, i.e. the local transformation estimated for an overlapping image pair based on their image contents differs from the corresponding transformation computed based on their positions and orientations in the mosaic. By numerical minimisation of a specially designed cost function, mosaic construction with error equalisation is shown, using simulated data as well as real NDT data, to offer an average misalignment error lower than the estimated local transformation. The corresponding Cartesian co-ordinates are [x/w ,y/w ] T , and [x/w ,y/w ] T . It can be shown that the two-dimensional projective transformation is an accurate model of the geometrical image transformation for arbitrary sensor movements and planar objects . If the sensor motion is restricted (e.g. panning or rotation only), the number of parameters to be estimated can be further reduced. When the component surface is not planar but can be approximately represented as a piecewise planar, the two-dimensional projective transformation model can be used locally . This model has three parameters, namely, the translation vector co-ordinates T=[Tx,Ty]T and rotation angle a. The meaning of these parameters is illustrated in Figure 1 which shows a rigid displacement between two images. Although simple, the rigid transformation is an accurate image displacement model for many NDT inspection methods, especially when the component to be inspected has a relatively simple geometry. For example, this model can be used for mosaic construction of ultrasonic, shearographic and thermographic images if the component surface is perpendicular (or almost perpendicular) to the optical axis of the camera. The mosaic construction of x-ray images is also possible using this model if the component to be tested is relatively thin and has a simple internal structure. 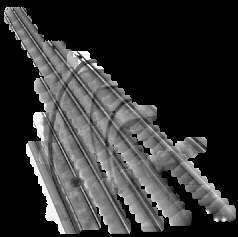 Having selected the image displacement model, the next step is to estimate its unknown parameters. Many methods are available. One of the possibilities is to detect predefined features  (for example corners, points or line segments) in the image pairs and then find the correspondence between these features. Using matched features the unknown parameters of the geometrical image transformation model can be estimated and subsequently used to align the images. However, this feature based parameter estimation method can not be used for the case of the dense motion fields. In addition, it requires presence of well-defined features (geometrical structures) in the image, which can be detected and subsequently used for parameter estimation. where I j (x k , y k), is the displaced k-th pixel of the j-th image in the co-ordinate system of the i-th image. This method can be used to estimate the parameters of the model described by equation (2) which includes the rigid transformation. The estimation procedure usually requires performing numerical minimisation in order to determine the values for the unknown parameters . Variations of this method with extra constraints added and images modelled as random fields have also been used to estimate dense motion fields . where I j (x k , y l) and I i ( xk , yl)	denote two images with the respective image mean values j and i. Since a higher value of the correlation coefficient function indicates a higher degree of similarity between the two images, it was applied to the overlapping areas of neighbouring images to estimate the transformation parameters. The translation vector and rotation angle are estimated iteratively. Following the initial estimation of the translation vector, the rotation angle is then estimated by moving the second image to the position defined by the translation vector found and transforming the overlapping images' sub-areas to polar co-ordinates (as rotation in Cartesian co-ordinates becomes translation in polar co-ordinates). The whole process is repeated until no significant changes in the estimated parameters are detected. To reduce computation cost, the calculations are performed in a hierarchical manner using image pyramid decomposition  with the translation vector and the rotation angle found for a lower resolution level used as the initial estimates for a higher resolution level. where and are respectively the translation vector and rotation angle between images i and j, matrix M defines adjacent image pairs with M i,j =1 and M i,j =0 indicating respectively sufficient and insufficient overlapping between images i and j, and m is the number of images to be aligned. With the transformation for all possible image pairs with sufficient overlapping found, the next step in the image mosaic construction is to put all images into a common co-ordinate system. The next section explains the difficulties associated with this task and describes the authors' solution to this problem. Figure 2 shows a diagram representing an example of a `rigid' mosaic of five images. The necessary geometrical transformations needed to align the five images in the mosaic are translation and rotation operations only. However, the relations (9) and (10) are unlikely to be true for the local transformations previously estimated, because they are obtained based on the similarity existing in an image pair without relating to their positions and orientations in the mosaic, and are also contaminated by some inherent estimation errors. Using the previously estimated local transformations based on image similarity, the images can still be placed into a mosaic as long as no closed loop is formed from them in the process. For example, in Figure (2), a mosaic could be built using the sequence of the estimated local transformations . Errors are accumulated as the local transformations are cascaded to build the mosaic. Consquently, the local transformation estimated using image similarity for images one and five, is usually not equal to the local transformation computed, (T1,5a1,5 ) using their positions and orientations of (x 1 ,y 1 ,q1 ) and (x5 ,y5 ,q5 ) in the current mosaic. As a matter of the fact, for large mosaics (containing dozens or hundreds of images) the local transformation estimated based on image similarity can differ significantly from those computed based on image positions and orientations. This means that the accumulated errors of the local transformation can cause a serious degradation in the mosaic quality and the estimated local transformations based on image similarity should not be used directly for mosaic construction. These optimal local transformations satisfy the consistency conditions as they are computed in equation (17) using the image positions and orientations in the mosaic. Furthermore, the optimal local transformations also satisfy condition (12) as the cost function reaches the lowest possible value when these transformations equal exactly to the local transformations estimated based on image similarity. All others entries of the Jacobian matrix are zero. The initial positions and orientations of the images in the mosaic can be obtained either from the NDT inspection system or if this is not possible, they can be computed from the estimated transformations between images in the acquired image sequence. After the correct alignment of all images, mosaic composition based on the Voronoi diagram construction method is performed to combine the overlapping areas of the neighbouring images into one image. In this method, the values of each pixel in the mosaic is taken from one image only with the image having the image centre closest to the location of the pixel concerned. The proposed method of the image mosaic construction was used to build mosaics for various NDT images of different aircraft components and acquired using different inspection techniques. Fig 8: Three ultrasonic sub-images of an aircraft component Fig 9: Constructed ultrasonic mosaic for images shown in Figure (8). Fig 10: Mosaic of 132 x-ray images. Figure 9 shows the mosaic constructed from three ultrasonic sub-images of an aircraft component shown in Figure 8. The mosaic was constructed without any initial constraints imposed on the images' position or orientation. The rigid transformation image displacement model described by equation (3) was used with the parameters estimated using cross-correlation coefficient function using equation (5). The proposed error equalisation method was used to compute consistent local transformation between images. Figure (10) shows the mosaic of 132 x-ray images of an aircraft component captured by using a real-time radiographic system. In this case, translation only was used to model the image displacement with the parameters estimated using the cross-correlation coefficient function. The initial positions of images were acquired from the real-time radiographic machine. Although the rigid transformation is only an approximation of the exact image displacement model, the developed method was able to produce the satisfactory quality mosaic in this case also. The paper presents a new method for error equalisation in the automatic mosaic construction. The results show that the proposed method achieves an average misalignment error lower than that using the local transformations estimated. Due to the high precision ensured by this method, the NDT mosaic image can be used to examine the structural integrity and geometrical dimensional tolerance of large aircraft component, to register NDT image data with the component CAD model, to fuse multiple NDT data types and to perform data compression . The work is supported by UK Engineering and Physical Science Research Council (EPSRC) under Innovative Manufacturing Initiative (Grant Ref: GR/L34464). Stiller C. & Konrad J., Estimating Motion in Image Sequences, IEEE Signal Processing Magazine, July 1999, pp. 70-91. Szeliski R. & Coughlan J., Hierarchical Spline-Based Image Registration, Proceedings of IEEE Computer Society Conference on Computer Vision and Pattern Recognition (CVPR'94), Seattle June 1994, pp. 194-201. Szeliski R., Video Mosaic for Virtual Environment, IEEE Computer Graphics and Applications, March 1996, pp. 22-30. Shark L.-K., Matuszewski B.J., Smith J.P., Varley M.R., Automatic Mosaic and Construction of Three-Dimensional Shearographic Surface Images, Proceedings of the IASTED International Conference on Signal and Image Processing (SIP'99), Nassau, Bahamas October 1999, pp. 183-187. Matuszewski B.J., Shark L.-K., Smith J.P. & Varley M.R., Automatic fusion of multiple non-destructive testing images and CAD models for industrial inspection', IEE 7 th International Conference on Image Processing and Its Applications, Manchester 1999, pp. 661-665. Andre R., Hendriks E., Biemond J., Correspondence Estimation in Image Pairs, IEEE Signal Processing Magazine, May 1999, pp. 29-46. Burt P.J., Yen C., Xu X., Local Correlation Measures For Motion Analysis, A Comparative Study, Proceedings of Conference on Pattern Recognition & Image Processing, 1982, pp. 269-274. Hansen M., Anandan P., Dana K., van der Wal G., Burt P., Real-time Scene Stabilisation and Mosaic Construction, Proceedings of IEEE Workshop an Application of Computer Vision, 1994, pp. 54-62. Brown L.G., A Survey of Image Registration Techniques, ACM Computing Surveys, Vol. 24, No. 4, December 1992, pp.325-376. Press W.H., et al., Numerical Recipes in C: The Art of Scientific Computing, 2 nd edition, Cambridge Univ. Press, 1995.